When I was growing up, my dad was obsessed with military planes. He knew just about everything about them. He could even tell you which type it was based on the sound of the engine alone. Given this, it’s no wonder that he and I found common ground in the Ace Combat series, specifically the fourth entry. Now, years later, I sat down to play Ace Combat 7: Skies Unknown and immediately thought back to those days. For those who are curious, worry not, my dad will love this game, and you will too. It’s time to check out the best arcade flying game you’ll find on the PS4. The Ace Combat series has always filled a perfect niche in gaming. It offers approachable aerial gameplay, advanced control options, fun dogfighting, and an engrossing story. The last numbered entry for the series was Ace Combat 6 on the Xbox 360, with a few other non-numbered titles since then, but none on PS4. Suffice to say, it was worth the wait. It all starts with the story, which has a pretty standard first act, but quickly changes direction and offers more than a few surprises. Much like prior games in the series, the cutscenes concern characters besides your own that will either reference events you’re part of, or you directly. You play as a pilot with callsign “Trigger” in the midst of a war between two fictional countries: the Kingdom of Erusea and the Osean Federation. The characters in the cutscenes range from a calculated scientist, to an aircraft mechanic with a history of flying in her family, among others as well. The story has a serious tone and plenty of political intrigue, but it never leans too far into the realm of cheesy. It balances the line very well, in fact, making for an interesting and engaging plot overall. There’s also an option for both English and Japanese audio, but I felt the English voice acting was just fine. With a solid story that manages to expand on the world and offer some interesting shifts, it’s time to talk about the gameplay this series is known for. You have the choice between standard and expert controls for those who want more options like pitch and yaw. Both work very well. Since this is more of an arcade flying game than a simulation, Ace Combat also offers some elements that make the game more enjoyable, while still offering some realistic mechanics. For example, your plane can carry an absurd amount of missiles and you can take turns that would make any experienced pilot pass out. This is balanced by other things, like flares and chaff for knocking missile locks off of you. Some new mechanics also take into account the clouds in the sky. Flying through them will hamper missile tracking for both you and the enemy. However, staying in the clouds too long will cause ice to build up on your wings, hampering your maneuverability. We will discuss the graphics in more detail momentarily, but one aspect that affects the gameplay are the improved ground details. Even in missions where the combat is primarily in the air, you’ll find that the terrain holds up incredibly well to close scrutiny. These types of games usually include flat and somewhat blurry ground textures, but this isn’t the case in Ace Combat 7: Skies Unknown. In fact, some levels will have you flying low through skyscrapers and near fully modeled buildings. This new attention to detail makes air-to-ground combat far more exciting than it has been in the past. Dogfighting, as you can imagine, is an important part of the experience here, and I’m pleased to say it returns in top form. Slamming your engines or pulling tight turns while holding a lock on your target feels great, and even on the lower difficulties you’ll find yourself dodging and chasing down tough enemy drones that move without the limitations of a pilot inside of them. Missions variety also sees a nice boost in Ace Combat 7. While some of the missions boil down to taking out the targets, new enemy types and even a very cool early game stealth mission spice things up and keep you playing for one more mission. Speaking of motivation, Ace Combat 7 also introduces an aircraft tree for your progression. By playing both single player and multiplayer, you’ll rack up points that allow you to unlock new aircraft, parts to install, and special weapons to equip. The tree is expansive, but the descriptions do a nice job of informing you which aircraft is best for various scenarios. 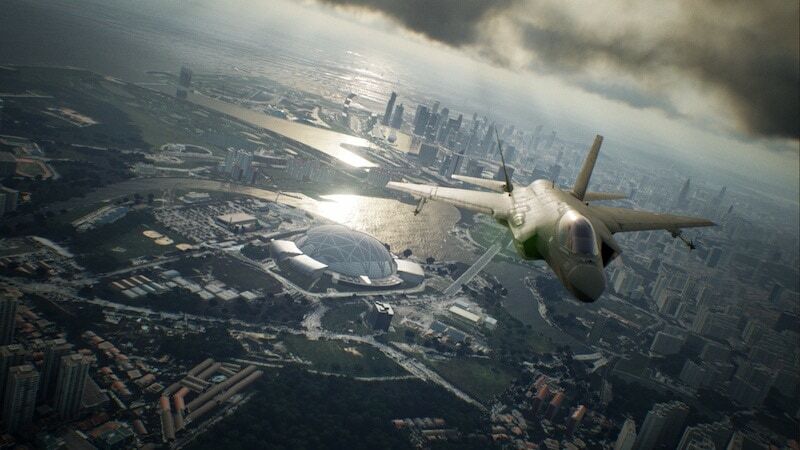 For those who want to test their competitive skills, Ace Combat 7 also features two multiplayer modes at launch: a point-based Battle Royale and a Team Deathmatch. While the campaign was my primary focus, those looking for their multiplayer fix will find plenty of action online. In addition to both the campaign and multiplayer, Ace Combat 7: Skies Unknown also features several VR missions. Let’s talk about that. 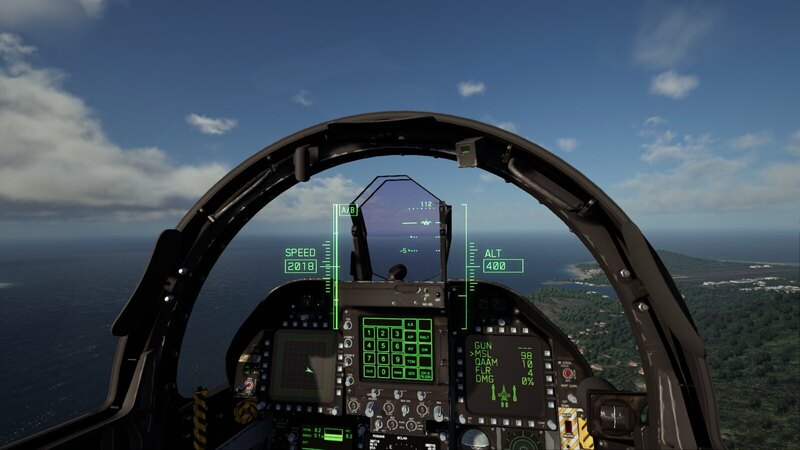 Ace Combat in VR: A Dream Come True? The original plan was to have the entire campaign in PSVR, but the team was forced to scale this back when they realized how time-consuming that would be. While that decision was probably for the best, the three missions we do get make a great case for Ace Combat in VR. In the PSVR missions, you play as Mobius-1 from Ace Combat 4 and while the missions are simple, the experience is remarkable. After playing and reviewing countless VR titles, it’s hard to really impress me, but Ace Combat managed to make it happen. It all starts with the excellent graphics and detail. As you can imagine, you play from a cockpit view in VR, but it offer surprising visibility. You can turn and look out the cockpit to see all around you, and the radar is conveniently on the dashboard in front of you. Looking down and seeing the flight suit on your body, combined with the detailed aircraft interior is nothing short of stunning. Once you’re in the air, the fidelity is impressive in both the aerial and ground graphics. I played in VR with headphones on and I was immediately immersed. Dogfighting in VR is incredibly intense, and while I could see some getting motion sickness, I felt fine for the most part. There were some times where I would fly upside down and feel my stomach flip, but the experience overall was superb. While you’re limited to three missions in VR, I’m hoping they may offer more missions down the road, even as paid DLC would be fine with me. In either case, we can consider this a major win for PSVR. Ace Combat 7: Skies Unknown is an absolutely gorgeous game from top to bottom. Certain things show small kinks in the armor up close, but the general presentation is exquisite. From the detailed planes, to the improved ground graphics, to the variety of details come together in a big way. Even the little details, like the fog on the wings when you take tight turns, or the shimmering air in your afterburners, or even the beads of water that gather on your craft when you fly through clouds, it’s all simply stunning to behold. Playing on PS4 Pro, the smooth frame rate makes for a polished and enjoyable experience. The entire experience is topped off with a powerful soundtrack that brings the heat from mission 1. The bombastic orchestral pieces really add to the tension and ramp up nicely when the combat gets intense. For fans of the series, Ace Combat 7: Skies Unknown is the triumphant return to form that we’ve all been waiting. For those who enjoy flying and dogfighting, you won’t find anything better on PS4 right now. Even if you’re just a little interested in trying this out, trust me, you won’t regret it. Take to the skies, and you may never want to come back down.